Highways England has announced that structural works for the 750m-long River Great Ouse Viaduct, which forms a major part of the A14 Cambridge to Huntingdon Improvement Scheme, have been completed. Said to be the UK’s biggest road upgrade, the £1.5bn scheme will transform journeys on one of the East of England’s most vital roads, and the completion of the viaduct is the latest piece of the puzzle to be put in place. 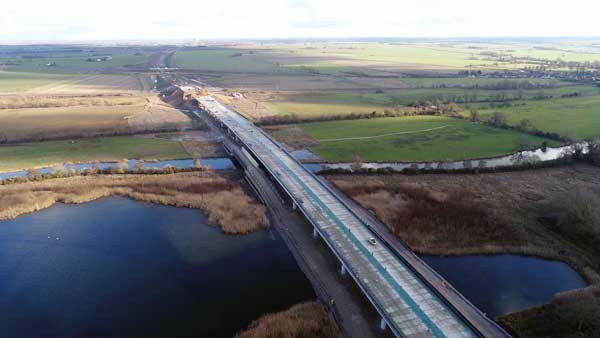 Willie McCormick, Construction Director for the A14 Cambridge to Huntingdon Improvement Scheme on behalf of Highways England, said: “This viaduct over the River Great Ouse, south of Huntingdon, is by far the biggest bridge on our 21-mile project. It’s taken over 18 months to build, and covers 750m to carry drivers over the river and floodplain – yet when it opens to traffic in 2020, drivers will cross it in less than 30 seconds. Some 64 pillars are needed to carry the viaduct over the River Ouse floodplain, each around 2m-wide and embedded up to 30m in the ground. The pillars support the 17 spans of steel beams and concrete slabs which form the bridge deck. When the new A14 fully opens by December 2020, the bridge will help to reduce journey times on the road by up to 20 minutes. Most of the viaduct’s main girders are up to 40m-long, 2m-deep and weigh 50t. The section of bridge that crosses the river has a longer 70m span, requiring more complex girders, with larger, deeper haunches to carry the greater load. Working on behalf of main contractor Costain Skanska Balfour Beatty JV, Cleveland Bridge erected 6,000t of steel for the viaduct comprising 76 main girders and 800 cross members.